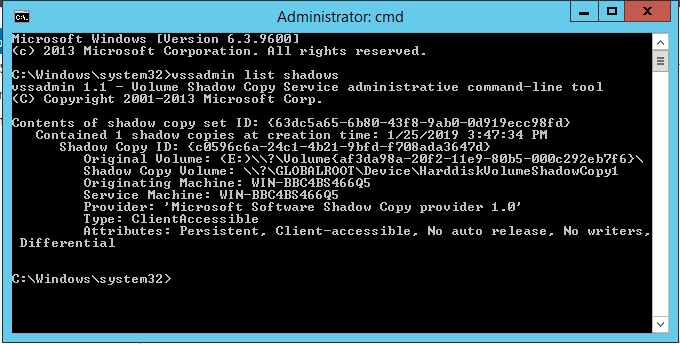 Does anybody has any definitive knowledge of WHAT Volume Shadow Copy service "uses" to identify the disk that Shadow Copies exist for? Ofcourse MS approach is that it can not be done. I would love to prove them wrong. 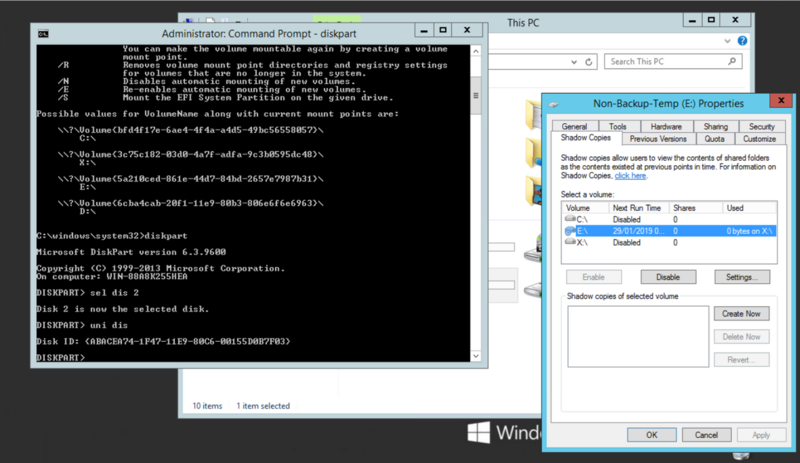 When source is hot plugged back, all shadows "come back"
i will try to download a windows 2012 r2 iso over the week end to test it there. what do you get with vssadmin list shadows and shadowexplorer? 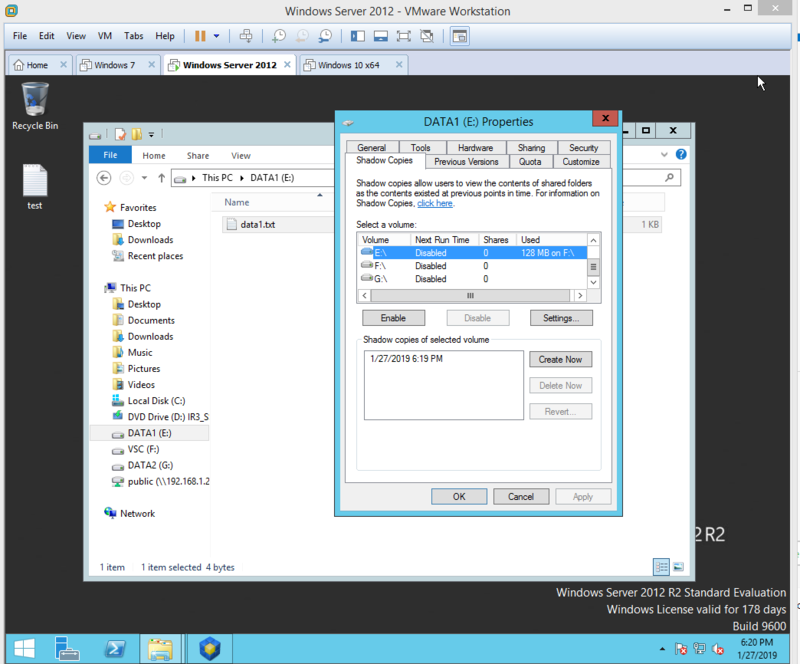 I installed a windows 2012 r2 in vmware workstation. Shadow copies are stored locally to this data drive so I guess it is an easy one. I will not wipe the entire data disk, recreate disk/partition, hence coming with a new volume guid and starting fresh. I will generate a volume shadow. Clone the volume to a new disk and see how it goes. 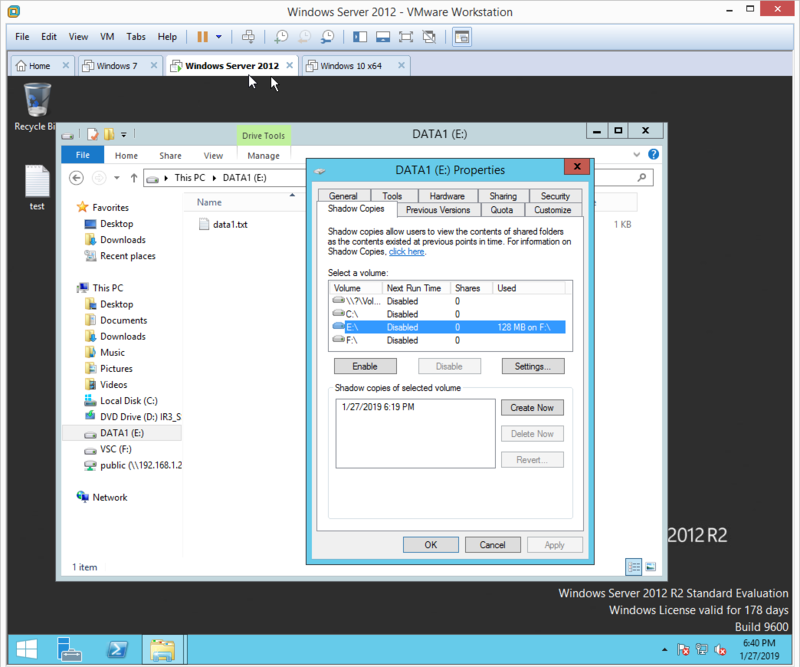 ok so on a fresh windows 2012 r2 standard in vmware workstation 11 and performing all disk/partition steps with clonedisk. That sounds like there is some sort of "watcher" service. Let me get this clear, set aside the "cloning" part. You have the shadow copy made. If you reconnect the same disk it remains missing or re-appears from nowhere? How many times do I need to state it? I will test this week end with shadow volumes on a dedicated drive. As many times as needed for the people trying and helping you to understand the details. So, the shadow copies do not vanish/are gone they become *somehow* hidden or however not anymore visible or "connected" to the volumes. This could be something *external* to the actual "normal disk operation". In a REAL (or forensic sound) disk clone - by definition - every single sector and byte of the source is identical on the target, or if you prefer, the source and target after cloning are indistinguishable at byte level. There could well be a field *somewhere else* (outside the actual volumes) that represents a "specific for shadow volumes only" kind of ID/Signature. 1 vs. 2 should show NO differences wnatsoever. In 3 above, when doing V2V the source & destination will be completely different. Shadow Copies are block differential backup copy, so most likely that is why. If you do #1 or #4 the result (target) is identical to the source. If you do #2 or #3 the result (target) is NOT identical to the source, this may be the case at hand. BUT I am not too convinced. Let's say (another thought experiment) that you have a Disk with a single volume on it. You have your nice Shadow copy of it. Then you physically detach the disk, mount it on another machine, delete a number of files and run a defrag on the volume. What happens when you reconnect the disk to the original PC? It is clear that at block level the volume inside the disk is different, but the shadow copy should still be visible/valid/etc. Stating the obvious (or already known) but just to be sure : CloneDisk does a byte to byte copy independently of the user selecting a disk or a volume, i.e it copies first byte to last byte of the selected item. The only difference (stating the obvious again) between a disk and a volume (from a imaging perspective) will be that the volume image will not include the disk "header". "Header" being a generic (possibly incorrect) word for bytes between offset 0 and starting offset (minus 1) of the first partition. 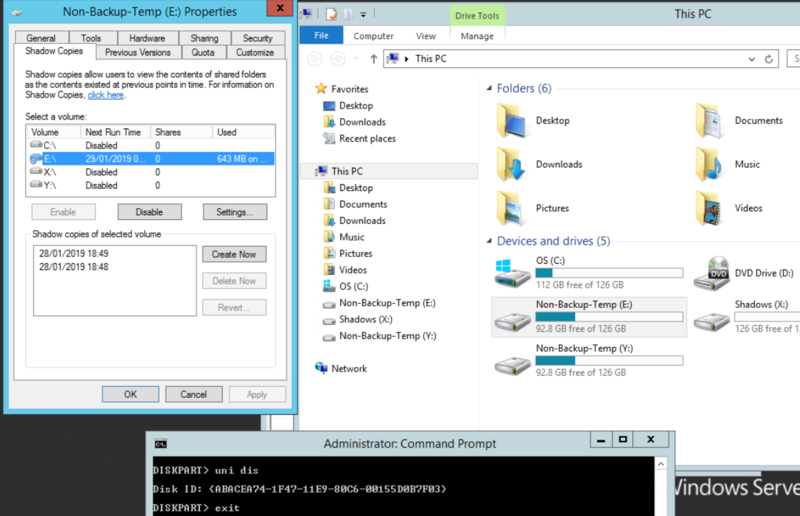 What would be interesting would be to compare original disk versus new disk where a volume has been cloned and where disk signature and partition id has been updated. The difference should be minimal. Worse case scenario, only the bytes between sector 0 and partition 1 starting offset should be different. Best case scenario : no byte should be different. -shadow volumes kept on a dedicated drive (F: - "VSC" drive). E: "DATA1" is my "original" data drive. About to clone it onto G: "DATA2", disconnect DATA1, "update" DATA2 header. Cloning volume onto another volume, disconnecting "original" disk, updating "replacement" disk with previous disk signature and partition id, I do not lose my volume shadows in the process. As far as I am concerned (i.e in my virtual lab), keeping the disk signature and partition id (and I believe the disk slot) does the trick : i.e i can clone a volume and keep its volume shadows. Original DATA1 has been disconnected. DATA2 "became" the new DATA1. Then removed the source, moved "slot" of destination, renamed DiskID/PartitionID of destination.